In just over a month things have taken an exciting turn in my IT career. 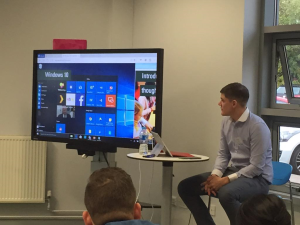 On the 15th of October I was involved in a Microsoft Redefine Learn event at Simon de Senlis Primary School, which involved me talking about how the school has implemented Office 365 and Windows 10. This was my first time speaking in front of a big audience so saying I was nervous is an understatement. Since this event I have been involved in other events at schools providing training and an insight into Office 365. After the event at Simon de Senlis I was asked to be a part of a short film that Microsoft were making. I have never done anything like this before so didn’t know what to expect. The camera crew were great and made me feel at ease with everything. The film was released a few days ago and it shows the school so well and tells the story of how well Windows 10 is working. I’ve also had my first blog post published by the Microsoft Education Schools blogs site. This blog was about how EasiPC successfully deployed Windows 10 at Simon de Senlis and any issues we had along the way. With all the work I’ve been doing with Simon de Senlis is was so nice to have some positive feedback from the Headteacher there, Tom Rees. We have both been working hard to make things work within the school. Paul and EasiPC have supported Simon de Senlis for around 4 years and during this time have helped transform Simon de Senlis from being outdated and poorly equipped to a technology rich learning environment which is now recognised as a Microsoft Global Showcase School. Paul’s knowledge of key educational and cloud technologies such as Windows 10 and Office 365 is first class and has enabled us to implement a bold Digital Strategy with one to one deployments of tablets and devices play a key role in making learning richer. Through his diligent and high level support across the Northampton Primary Academy Trust Partnership, Paul is helping us to achieve the great ideas and big vision that our teachers and school leaders have. As a key player in the Microsoft Education Community, Paul is able to ensure that we benefit from the latest ideas and technologies, many of which are free. To put the icing on the cake I received an email a couple of days ago congratulating me on being accepted as a Microsoft Innovative Educator Expert (MIEExpert). For me this is a massive achievement and I feel so privileged to have been successful in my application. The next year is sure to be a very exciting one and will bring in so many possibilities for myself.